Over the years, many established bands have attempted to update their sound. But doing so isn’t easy. Some manage their sonic make-over successfully, while others fail miserably and, at the behest of disgruntled fans, go back their roots. Rush are one of the few bands that managed to pull it off. Perhaps it was because they didn’t use the hope of crossover chart success as a major motivating factor. Instead it was a more natural process, and also reflected the music they were listening to at the time (The Police, Talking Heads etc). 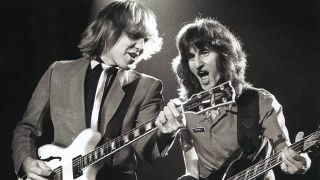 Lifeson also points out where the song’s title came from: “I think that was a common motto for radio stations at the time. Like, you’d hear [speaks in a DJ voice] ‘The Edge, 102!’ There was a station here in Toronto, CFNY, that used that as their call motto. But it wasn’t really specifically about them – it was more about the idea.” Also included in the song is a tip of the cap to Simon And Garfunkel’s 60. classic The Sound Of Silence: “_‘_The words of the prophets are written on the subway walls, and tenement halls/And whispered in the sounds of silence’ became ‘The words of the profits are written on the studio wall, concert hall/Echoes with the sounds of salesmen.’ Just a play on words – Neil being a little clever,” Lifeson says. It also saw Rush touch on reggae during a brief break-down section, no doubt due to their appreciation of the then-burgeoning Police. Although always thought of as an album band, Rush scored their first proper Top 20 UK hit single with The Spirit Of Radio, which peaked at No.13. The Spirit Of Radio quickly became a concert high point, often used as a set opener. To what does Lifeson attribute its popularity and longevity? Rush’s music played live has always been ‘sonically rich.’ So have you ever wondered how they did it all with only three pairs of hands? Thanks to the discovery of Moog’s Taurus pedals, Geddy Lee and Alex Lifeson were able to play two instruments at once on stage. Manufactured by Moog between 1976 and 1981. the device looked a set of organ pedals, and enabled someone to play a synth part with the tap of a foot while playing, say, a guitar or bass. Discontinued long ago, vintage Taurus pedals now fetch tidy sums. Other bands who have used Taurus pedals to beef up their live sound include Styx, U2. The Police, Yes, and Genesis. The appeal of _The Spirit Of Radio _stretched far and wide. Even British alt. dance rockers Saint Etienne later lifted a sample of Lifeson’s opening riff and used it [uncredited] on the track Conchita Martinez on their 1993 album So Tough.